This is a directory of Boer-Goat-Idaho and if you wish to add your details or change details then please use the Directory Form. Weiser River Boer Goats. Located On Weiser River Road just 5 miles East of Historic Weiser Idaho. We raise fullblood, purebred, and percentage boar goats. We are very active with 4-H and strive to raise healthy strong kids. We are at 1851 Weiser River Rd, Weiser, Idaho. Ed and Terry Watts. Give us a call or drop an e-mail at teddey35@msn.com. Clearwater Ranch Boers. Well the story goes we started out with getting 2 goats to utilize as weed burners. From there it grew into a 4-H project for our daughter which then evolved into our raising and breeding the Boer Goats. At first we couldn't comprehend how one little goat could cost so much, but we soon found out. We started with the 2, bought 2 more and they kept coming until we ended up with 12 does and 2 bucks. We bred six of our does that kidded this February, (we also learned you don't pasture breed because chances are good they will all kid around the same time and they did!) we ended up with 12 healthy, vibrant and beautiful babies. So that is the gist of our story and on top of our kids and all the 4-H we have met and been blessed with friends that we now consider family. Thank you to everyone out there who has gave us advice, taught and showed us the way. We are a work in progress but we are getting there and we have had so much FUN in the process! Thank you, The Davis Family. Go back to the best boer-goat-breeder information, for details of other breeders in others states or international goat breeders. 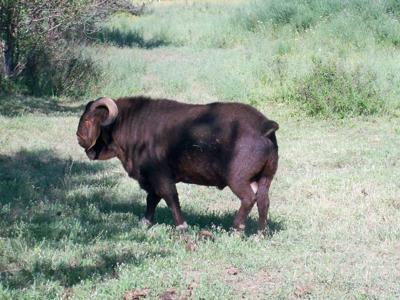 Check out the Boer-Goat-Idaho information.